Any quilted project can really just make a house feel like a home. Even if it’s not a quilted blanket, incorporating this wonderful activity into anything feels cozy and comforting. So today there is a different kind of project called No Binding Pot Holders. It’s brought to us by Sheryl from The Sewing Room Channel. The pot holders are so cute and they looked puffed up, as if there are binding at them. At first, binding can be kind of confusing and hard to get a handle on so this is extremely friendly! If there is anyone out there who just want to focus on mastering one part of quilting for now, this project is for you. The fun thing about the no binding project is the possibility of preparing for any holiday or even giving them as a nice housewarming gift. There is nothing like a homemade gift! These potholders are great for saving money while adding some cuteness to our kitchens. As seen in the video, a panel fabric makes the process easier. Panel fabrics are fabrics that have square pictures on them. 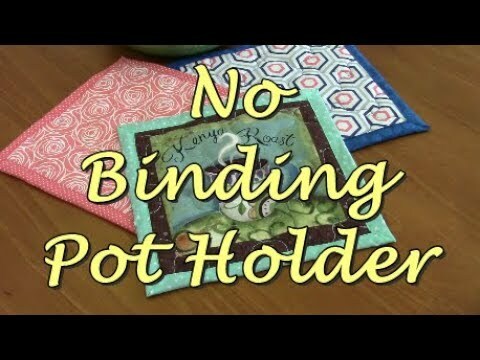 For beginners, this is recommended and Sheryl explains how nifty these are for the no binding pot holders. Before starting the process we will need 1 eight inch square, 1 ten inch square, and 2 eight inch squares of cotton batting. After gathering all of our materials we are ready to get started. Sheryl is very thorough with her explanation which is very helpful, especially for beginners.